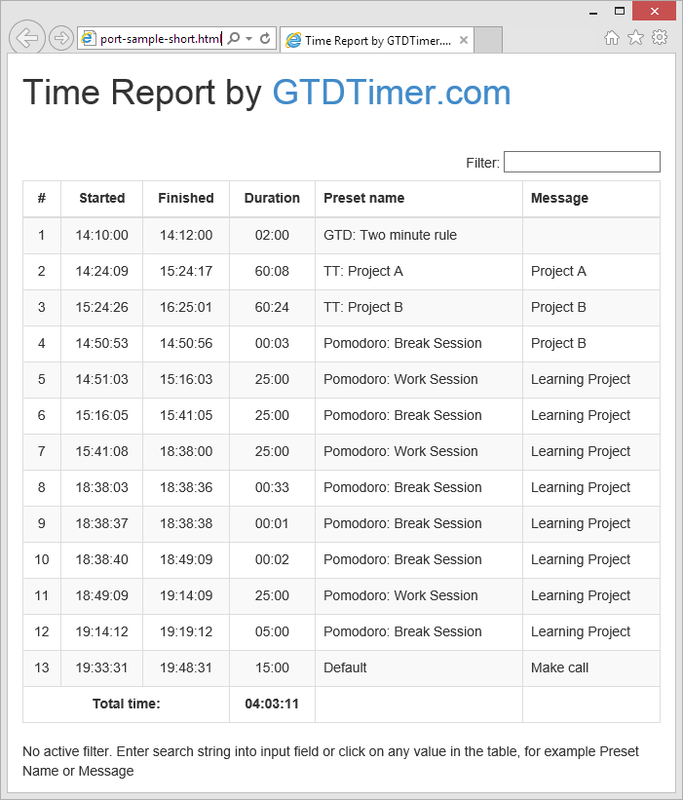 What's new in GTD Timer 2015? Generally, this rule means: if some task can be done in less than two minutes, do it now. Productivity Scientific GTD Timer starts with predefined time of two minutes by default and you can start countdown with one keystroke. Of course this does not mean that you can countdown only for two minutes - any reasonable time period may be used from seconds to hours. Time budgeting is a very popular time management technique, because time likes counting like money does. And even more, because you can get more money but you can't get more time - all people get the same amount of time each day - only 24 hours. That's why it is incredibly important to set a time budget for certain activities similar to process of setting money budget before making purchases. GTD Timer helps to set time budget by limiting amount of time that you are planning to spend for a particular activity. Before starting anything, ask yourself how much time you are willing to invest in that activity. Launch GTD Timer with planned amount of time and stick to your time budget. GTD Timer can be used to display amount of time which is left before completion of some activity. You can use it as auction timer, presentation timer, kitchen timer, display time left for rest break or working day. You can set time period to countdown or enter time when the activity ends using "T" prefix (see). GTD Timer is very suitable as personal reminder. When starting timer you may enter message to yourself and this message will pop-up when timer will finish countdown. You may start any number of timers simultaneously (available in registered version) with different reminders. Using presets and commands you can automate reminders. For example, you can create reminder preset which opens e-mail client and use it when you create reminder to send letter for anybody (with "mailto" command). Using "net send" command you can create reminder which sends message for other people in local network. Using presets with commands GTD Timer is exceptionally suitable to use as scheduler to run commands at a specified time. For example, you can create preset to shutdown a computer after some task finishes (as described in documentation). You can use virtually any command: launch programs, run batch files or single commands and so on. Many online services place users to waiting queue for some amount of time. For example, RapidShare file sharing service allows unlimited downloads only with RapidShare Premium Accounts, but if you use free account you have to wait for some amount of time between downloads. It is annoying to remember exact time when to return to window of the browser. GTD Timer is very helpful in such situation. 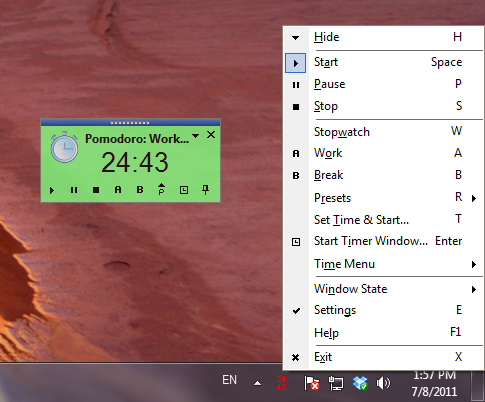 GTD Timer running built-in Pomodoro Work Session preset. See more about Pomodoro technique support. GTD Timer displays overtime in GTD: Two minute rule preset. GTD Timer running in stopwatch mode. Sample Time Report in HTML form shown in the picture below. Visit Time Report page for detailed description. and tray icon displaying time (on the bottom near lower left corner of the context menu). Start Timer window appears on the software start (configurable) and allows to run GTD Timer with desired parameters. See how to use Start Timer window. Open settings window to configure the software. 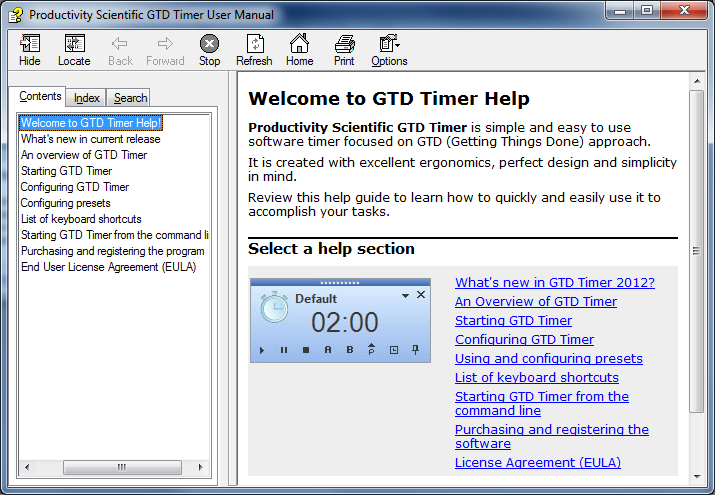 See how to configure the GTD Timer. Preset support is powerful and unique feature of GTD Timer. Use presets to run the software from one click or keystroke with set of predefined parameters. Read more about using and configuring presets. Help system is accessible via F1 keystroke, context menu and buttons. It contains full description of software features and usage examples. When starting GTD Timer opens Start Timer window (see in the picture below). Use this window to setup parameters for the timer. To navigate between controls use Tab key. If you want to skip this window, click Cancel button or press Esc key on the keyboard. After entering parameters press one of the buttons at the bottom of the window. Preset (required, default value automatically chosen) - presets used to run GTD Timer with predefined parameters or to distinguish between different instances of the running software. Button with semicolon near this field allows to setup chosen preset. See Using and configuring presets help section for more information. Entering time in time string mode can be done in two ways: 1) as a time period or 2) as a time moment during a day. 2) To enter time as a time moment you have to type prefix symbol "T" and follow it (with or without a space) within a certain time with a standard format of hh:mm:ss or hh:mm. Also you can use AM/PM mark or enter time in 24-h format. Example: "T 10:00" (make countdown till 10:00 AM). When you enter time as a time moment and press Start button time period for countdown automatically calculates based on a current time and a maximum length of period for 24 hours. For example, if current time is 10:20 A.M. and you enter "T 11:00 AM" then period for countdown calculates as 40 minutes, but if you enter "T 10:00 AM" then period for countdown becomes equal to 23 hours and 40 minutes. Also you can run GTD Timer in stopwatch mode by entering "S" into Time field. Button with semicolon near this field allows to open Set Time window. Message (optional) - enter message that identifiers the timer or reminds you what to do when countdown finishes. This message will be displayed on the timer's window, shown as hint if you move mouse pointer over the timer's tray icon and displayed as pop-up balloon in System Tray when countdown finishes. 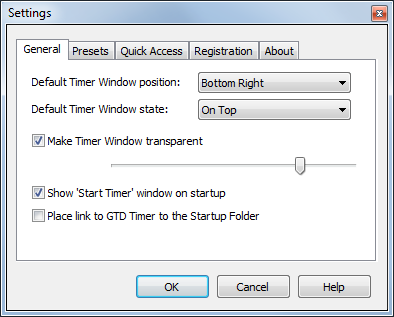 If checkbox "Show this window on startup" is checked then this window appears when GTD Timer started, otherwise you can open this window using button on timer's window or via popup menu accessible from timer's icon. To open timer configuration dialog call Settings menu item from GTD Timer Tray Icon context menu (do right mouse click on timer's icon to open the menu). General settings tab is shown in the picture below. Preset settings tab is shown in the picture below. Presets include numerous parameters to precisely configure software behavior for every specific task. Use this window to create, remove, duplicate and reorder presets. Click Setup Preset button to access Preset Setup window. 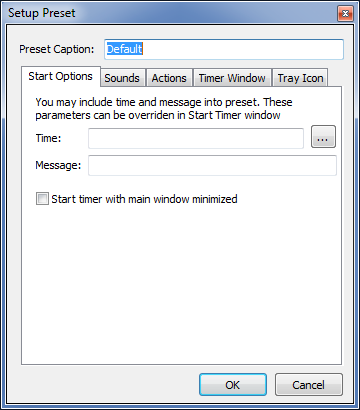 Select checkbox Auto-select next preset after opening new window to allow GTD Timer automatically select next preset when opening time select window. Quick Access tab is shown in the picture below. This tab allows to link buttons in Start Timer and Main Timer window with custom presets. You may choose two custom presets A and B buttons and configure one preset for Stopwatch button. GTD Timer allows to create presets - sets of parameters used to recall predefined settings for the software. Use presets to create customized sets of settings for every specialized task. You may quickly recall presets from drop-down menu, keyboard shortcuts (Alt + Preset number in main timer window) or run GTD Timer from command line with preset number as parameter. To access presets configuration open Presets tab in Settings dialog (Settings dialog accessible via Tray Icon context menu item Settings). Presets tab is shown in the picture below. Use this window to add, remove, rename, duplicate, reorder presets, access Setup Preset dialog, reset list of presets to default if required. The checkbox Auto-select next preset after opening new window used to automatically select next preset in time selection dialog when multiple copies of the software running. To access preset configuration dialog press Setup Preset... button. Setup Preset dialog appears (shown in the picture below). Use Preset Caption field to name preset. It is recommended to use such a name that helps you easily distinguish different presets. You may include Time and Message into preset. Theses parameters can be overridden in Start Timer window. Check Start timer with main window minimized to hide main window when timer starts. Sounds tab is shown in the picture below. Configure Alarm sound to play when timer finishes countdown. Configure Ticking sound and set period to play when timer is counting. You may choose any audio file in .WAV format for Alarm in as well as for Ticking sounds. Actions tab is shown in the picture below. Use this tab to setup actions on countdown completion. Command lines run using operating system ShellExecute function. Timer Window tab shown in the picture below. Use this tab to setup time display in main timer window. You may enable option to display milliseconds, configure time display font and colors for different timer modes. Tray Icon tab shown in the picture below. Use this tab for setup Tray Icon display options for the timer. You may setup Tray Icon font name and size (recommended to use Small Fonts with size 6 or 7 pt) and text color. Setting different colors for different presets help to distinguish between multiple running instances of GTD Timer. While using main window shortcuts be sure that main window has input focus (do mouse click on timer's window, icon for example). GTD Timer timer can be run from command line. You can create one or multiple shortcuts to the software executable (gtdtimer.exe) and pass parameters to it. Alternatively you can start timer from batch files. Remember to precede executable file name with full path where the software was installed or add the path to the system environment PATH variable. /T - Time to countdown, format is the same as used in Start Timer window. This parameter is obligatory. /M - Message string for the timer, use double quotes to enclose messages with spaces. This parameter is optional. /P - Preset caption. This parameter is optional, used first profile if omitted. /ID - Unique number for each running instance. If software instance with this ID is already running, it exits and new copy replaces it. By default, ID is equal to zero. Start GTD Timer and countdown till 18:00 with message "Time to go home"
gtdtimer.exe /T=T18:00 /M="Time to go home"
Start GTD Timer and countdown for 10 minutes with message "End of a break!" gtdtimer.exe /T=10 /M="End of a break!" gtdtimer.exe /T=45 /M="System shutdown" /P="Shutdown System"
GTD Timer is a commercial software distributed on try-before-buy approach - you may test full version of the software for 15 days. At the end of 15-day evaluation period you should purchase a license and register the software or stop using it and uninstall it from your computer. You can purchase a license and obtain a serial number from the GTD Timer website: http://GTD-Timer.com or from official Productivity Scientific website: http://ProductivityScientific.com. Please note that the actual purchase transaction is performed by our partners - registration services that are well-known and secure companies. The Productivity Scientific company does not have access to your financial information (like a credit card number, etc.) during the entire process and after the transaction. While obtaining the license, you should provide your full name and e-mail address. For security reasons the Productivity Scientific company will send your serial number only to the provided e-mail address. Serial numbers for all our software delivered immediately after end of the purchase transaction. You can use registered version of the software just few minutes after starting the transaction. To register the program you have to enter your full name, e-mail address and serial number to the corresponding fields on the Registration tab of the Settings dialog box. The Registration tab is shown in the picture below.